The 2015 Giro will be remembered for Bertie Contador’s opening bid for the GT Double (if not triple – Giro | Le Tour | La Veulta). There’s no doubting that even when isolated, the dancing Spaniard is a formidable sportsman. However, for me the Giro will be remembered for it’s audacious attacks and breakaway wins, that seemed truly impossible at the time. Nevertheless we all sat at the edge of our seats, gripping the sides of our television-sets, laptops and phones – yelling the rebel in red on – Forza! Forza! – Power! Power! And I think he heard us. 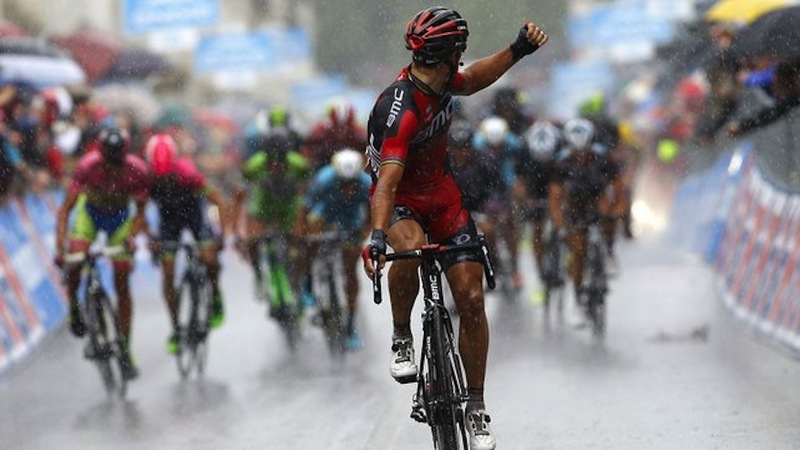 Stage Twelve, from Imola to Vicenza was a perfect day for the Baroudeur in the peloton; it was raining hard. A duel was emerging in the closing kilometres of the day: KOM specialist and local hero, Pellizotti and Aru’s loyal domestique, Kangert. At every pedal stroke, the road would rise to greet them. Under the 1km red banner, Kangert took the lead, whilst Pellizotti tucked in behind. At 800 metres to go there was no one in sight behind them. Then from 300, three men in red emerge to lead the peloton back into the fight. As the climb gets harder and harder, the final man in red breaks from the pack. It looks a long way to the line and everyone can see the finish. 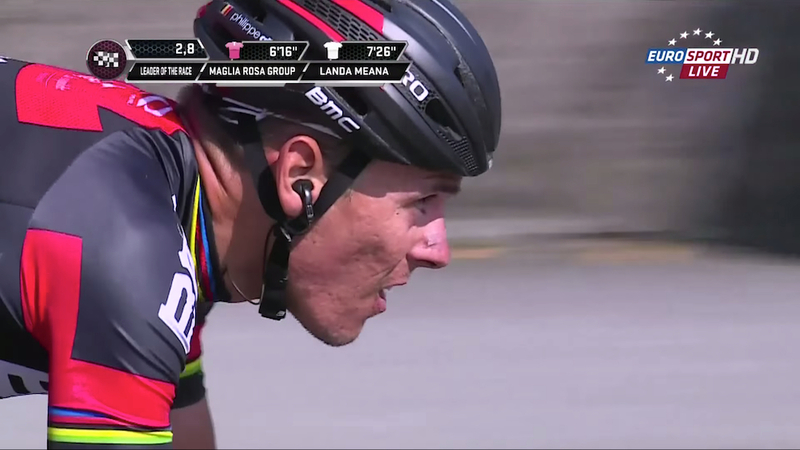 Philippe Gilbert rises. He kicks. He grits, then turns back to check on his peers. Raising his hand and shakes a clenched fist. Right behind him is Contador. And considerably further back is Aru. At 170km, Stage Eighteen from Melide to Verbania was guaranteed to be breathtaking. Thanks to it’s beautiful setting, and cleverly designed route. It was primed to be a day for the brave few who could hold a breakaway! Six stages on from Vicenza, the sun now graced the Giro with an all day appearance. That gave the riders every confidence to attack hard, and attack they did. The early breakaway saw a crash caused by one of the official staff-motos (motorbikes). Down went Mr Ferrari and talented Mr Cunego. In the meantime the race continued with a strong contingent in the break that consisted of some of world-class puncheurs. But as the climbs hit them, they dwindled to a select four. With Bertie protected against all comers in the pack, whilst the break gained to 35kms and 8+ minutes on the clock, the stage looked to belong to the Barouderus-Breakaway. Two Italians: Nocentini and Busato; one Frenchman: Chavanel and a certain Belgian – Gilbert. This is a part of the country that Gilbert knows well. It is regularly part of the landscape that shapes the Giro di Lombardia; a race he has won no less than twice before. As the distance rolls below 30, former Giro winner, Ryder Hesjedal of Canada, makes his mark on the Maglia Rosa; leading Bertie to the finish, and with it, the all important time bonuses. But as for the stage, it belongs to the man who wants to share his delight with the world. So rarely now do we get to share the intensity and victory with the riders. With the need for helmets and protective-eyewear, there’s now more than ever, a thin barrier that separates us from their emotions. Masked is every climb, push, loss or win. For a moment, Gilbert chooses to remove this separation. By peeling off his glasses we could witness and share in his jubilation. 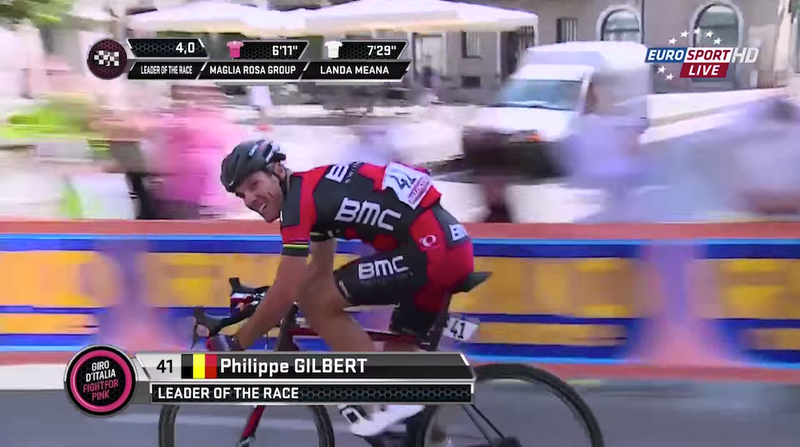 Phil-Gil rides solo to his second Giro stage victory!